The SSL Live.L300 brings the massive sound of SSL to the compact live console arena. V2.5 delivers new advanced FX optimisation and 27 new features and updates to the SSL Live console platform. 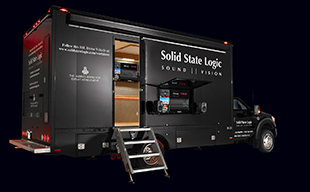 OXFORD, ENGLAND – Solid State Logic is extremely proud to announce a major expansion to its Live console range with the release of the SSL Live.L300 console and a new V2.5 software release that brings significant developments to the SSL Live console platform. Since the introduction of SSL’s first live console in 2013, the speed with which operators can achieve outstanding results with its consoles has been praised by leading engineers around the world. Just one year on, the release of the new L300 console and a major new software update signals SSL’s dedication to remaining at the leading edge of the live sound industry for many years to come. L300 and the new V2.5 software release embodies the SSL tradition of listening to engineers and customers and demonstrates our commitment to rapid continuous development. The L300 will be shown at the 137th AES Show in Los Angeles on booth #1409. The new release means there are now two models available in the SSL Live console range, the larger L500 and the new more compact L300. Both consoles are perfectly equipped for applications in Touring, Installation, Houses Of Worship and Theatre. At SSL we believe that offering a more compact console should not mean compromising and reducing quality or features. Both consoles offer the same immaculate, huge SSL sound and the same superb operator experience. There are no compromises in build quality and both consoles use and can share the same Remote I/O. The L300 is physically smaller than the L500, so it is a more compact, lower cost option… with no hidden performance compromises – it’s that simple. Compact it may be but the L300 delivers the power and connectivity to handle large scale productions with up to 568 input/outputs, 128 processing paths (96 full, 32 dry), a 32 x 36 matrix, 36 VCA’s, and 48 FX slots. If you want to compare connectivity and channel count of the two consoles, you will find a simple ‘L500 Vs L300’ comparison table on the SSL web site. The new Follow Mode feature allows the Select, Solo and unique Query function buttons found on the Live console Fader Tiles to be linked together in any configuration an engineer might require. Each of the three Tile buttons can be programmed to ‘follow’ any of the other buttons on a per channel type basis. Allowing input channel, Auxiliary and Stem Group mix bus operation of the buttons to be linked in different user defined ways. A simple user interface offers fast and customisable setup of the Follow Function. Offering ultimate flexibility for operator workflow and allowing engineers to access the channels they need quickly and efficiently. The Tempo Link feature adds the ability to link and control the Tap Tempo of any Delay effects loaded into the L500 and L300’s Effects Racks. Allowing up to 6 independent Tap Tempo functions to be controlled via both the hardware User Buttons and consoles multi-gesture touch screens. If multiple Delay effects need to be controlled by the same Tap Tempo, all the operator needs to do is load those effects into the same rack and enable their Tempo Link functions and they are immediately linked and their tempos linked together. The Master Tile User Buttons have now been activated and offer access to the 6 Tap Tempo functions that are part of the new Effects Rack Tempo Link feature and also direct access to 4 of the most used menus of the Live consoles. The User Buttons now offer direct hardware access to these key functions and can be switched simply between Mute Groups and User Buttons with a single button press. Both sets of functions are also available via the new Home Menu which is also part of the V2.5 feature set. As part of the feature expansion within the V2.5 software release, a number of new menus have been added to the Channel Control Tiles Home button, which includes its own multi-gesture touch screen. These include access to the Mute Groups and User buttons from the Tiles and also an Automation View, which gives access to and visibility of the console’s scene list, scene notes and many other automation functions. This feature allows the contributions of entire mix buses to be copied across the Live console’s flexible bus structure. Copying between Mono, Stereo and LCR configured mix buses is included and it is also possible to copy across all mix bus types. Allowing Auxiliary bus contributions to be copied to Stem Groups and vice versa. This feature offers very fast and powerful mix bus copy/paste feature that is useful for any mixing application. L300 and V2.5 will be available from November 2014. A new L300 compatible version of SOLSA, SSL’s OffLine Setup Application will also be released alongside V2.5.